A collaboration with Madeleine Flynn and Tim Humphrey, commissioned by Experimenta for Playground International Bienalle of Media Art, 2007. Installed at the Victorian Arts Centre, Melbourne. 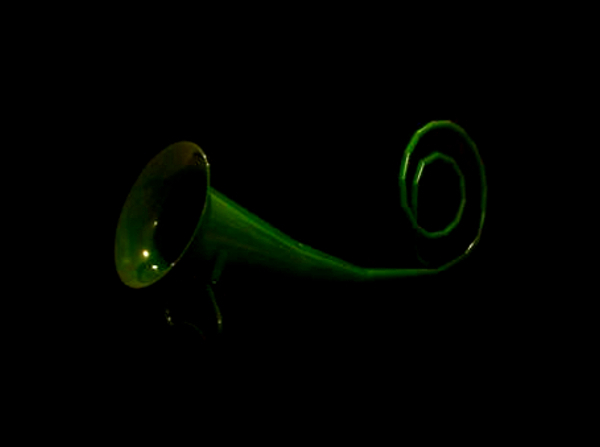 Kneel down on the mat and lean into this gigantic green megaphone to listen to the sounds of disembodied voices, and create your own. Human Canon is an interactive sculptural installation that offers a public space for listening, amplifying and projecting sounds. It also invites your response as it records human utterances and noises, adding these to an expanding collection of sounds created by previous participants. Inside the space of the megaphone participants can interact by listening and responding to the sounds that are simultaneously captured and relayed by custom made software. Responding to the sounds within, the megaphone builds a large time-texture. Human Canon builds a soundscape incorporating a polyphony of disembodied voices inviting participation in a play of call and response. This sculptural installation resembles a giant cornucopia, overflowing with an abundance of sounds. Human Canon is part of The Megaphone Project, an elaborate exploration of interactive play combining listening and sound creation within a public space.